Gaby and I are saying goodbye as editors of the Journal. We have enjoyed collating, editing and publishing it since 2009, but we both feel it is time to hand this work over now to the next generation. If you like communicating with Haidakhandis from around the world, and keeping up to date with Babaji events and community gossip, new publications and inspirational teachings, plus enjoy editing, this might just be the job for YOU! Sanjeev is kindly offering to continue to design and publish it and arrange for it to be printed in India, into the future. All we need is a new Editor! 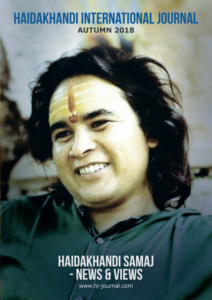 We can truthfully say that Babaji and his teachings, and devotees experiences, touched us personally with each and every edition. We hope and wish the same for the next editor(s). 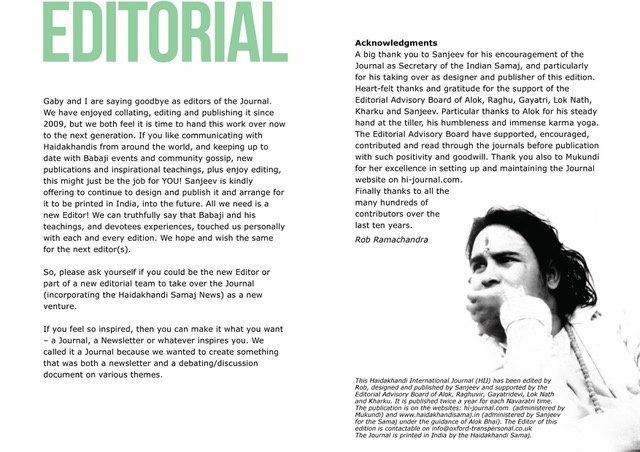 So, please ask yourself if you could be the new Editor or part of a new editorial team to take over the Journal (incorporating the Haidakhandi Samaj News) as a new venture. If you feel so inspired, then you can make it what you want – a Journal, a Newsletter or whatever inspires you. We called it a Journal because we wanted to create something that was both a newsletter and a debating/discussion document on various themes. A big thank you to Sanjeev for his encouragement of the Journal as Secretary of the Indian Samaj, and particularly for his taking over as designer and publisher of this edition. Heart-felt thanks and gratitude for the support of the Editorial Advisory Board of Alok, Raghu, Gayatri, Lok Nath, Kharku and Sanjeev. Particular thanks to Alok for his steady hand at the tiller, his humbleness and immense karma yoga. The Editorial Advisory Board have supported, encouraged, contributed and read through the journals before publication with such positivity and goodwill. Thank you also to Mukundi for her excellence in setting up and maintaining the Journal website on hi-journal.com. Finally thanks to all the many hundreds of contributors over the last ten years. This Journal is printed in India by the Haidakhandi Samaj.